Star Wars: Why Has Harrison Ford Always Wanted Han Solo to Die? Star Wars: The Force Awakens will finally be available on VOD next weekend. And to celebrate, Harrison Ford has been making the press rounds. Most have seen the movie by now, but in case you are waiting for the home release, beware! There is a MAJOR SPOILER in the next sentence. As you probably know, even if you haven't watched this blockbuster sequel yet, the movie ends with the death of iconic character Han Solo. It's no secret that Harrison Ford has always wanted the space pirate to die. And now, he finally got his wish. But he didn't want the on-screen act to happen for the reason most people think. EW held a Q&A with Harrison Ford, where fans were allowed to ask him pretty much anything under the sun. And of course, the topic of Han Solo's death at the hand of his own son Ben Solo, was a hot topic of discussion. Most believed that Harrison Ford wanted the character killed off because he was sick of playing him. The actor first petitioned the idea to George Lucas when he was shooting Star Wars: Episode V - The Empire Strikes Back. He then again lobbied for Han's death in Star Wars: Episode VI - Return of the Jedi. But it wasn't until this past December, in Star Wars: The Force Awakens, that the man finally saw it happen. But the cause was much nobler than you might think. Says Harrison Ford about wanting Han Solo dead. "I think it's a fitting use of the character. I've been arguing for Han Solo to die for about 30 years, not because I was tired of him or because he's boring, but his sacrifice for the other characters would lend gravitas and emotional weight." That makes perfect sense. And I think we can all agree that we're glad the death came when it did. Because Star Wars: The Force Awakens would have been kind of a let down without the presence of Han Solo. We don't have to be too sad about his passing either, as Harrison Ford is also reprising two more iconic characters in the upcoming years with both Blade Runner 2 and Indiana Jones 5 on his plate. Will he kill off those characters as well? Only time will tell. Director J.J. Abrams and Harrison Ford worked closely together to make Han Solo's death as emotional and effective as possible. The sacrifice was set up to help define the new characters and their struggles as the franchise continues. There have been some rumors that Han Solo might actually show back up in Star Wars: Episode VIII for a flashback cameo, but that's the type of surprise that won't be confirmed until the movie hits theaters in December 2017. And it's extremely unlikely that the character, who is not a Jedi, would ever come back as a Force Ghost. Related: Can Infinity War Break Force Awakens Opening Weekend Record? During the Q&A, Harrison Ford admits that he wouldn't mind doing voice work, and that he's looking for the 'right fit'. 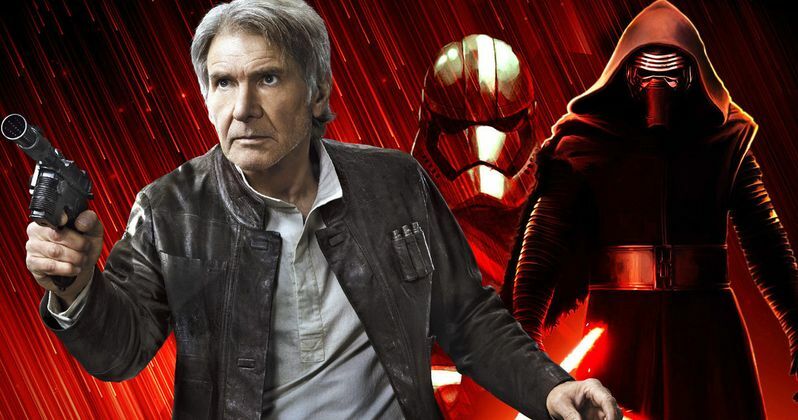 Some have speculated that the actor could return to voice Han Solo in an animated project. But that seems very unlikely at this point. And while there were rumors that he might bookend the Star Wars Anthology: Han Solo movie, that also sounds unlikely. Even if Harrison Ford isn't coming back, the character isn't going anywhere. He'll not only be the main focus of the second spinoff, he's also getting his own Marvel comic book miniseries. And there are rumors that he'll show up in some of the other standalone movies.